Disclosure- My family received a complimentary stay at Castaway Bay to help facilitate this blog post. 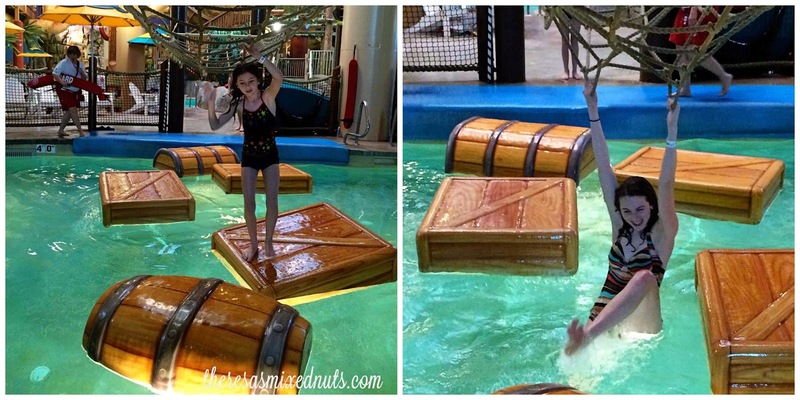 Last weekend, my family had the pleasure of attending another blogger event at Castaway Bay. It's something Mariah and Allison have been looking forward to since we went last year. With heavy snow storms headed our way that weekend, I admit, I was also eager to throw on my bathing suit and relax in 82 degree bliss. One thing that we really love about Castaway Bay is the atmosphere. As soon as you walk in the door, you feel like you have been whisked away to a tropical retreat. 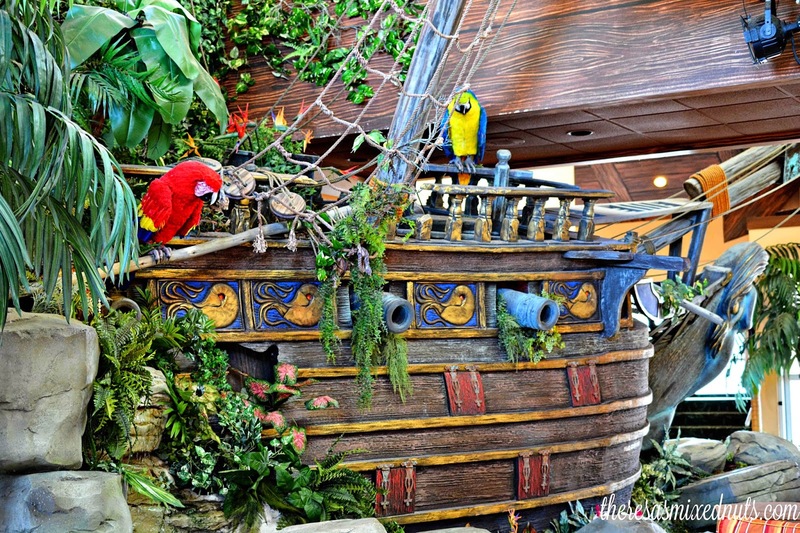 Right when you step inside, you are greeted by a really colorful and fun shipwreck. 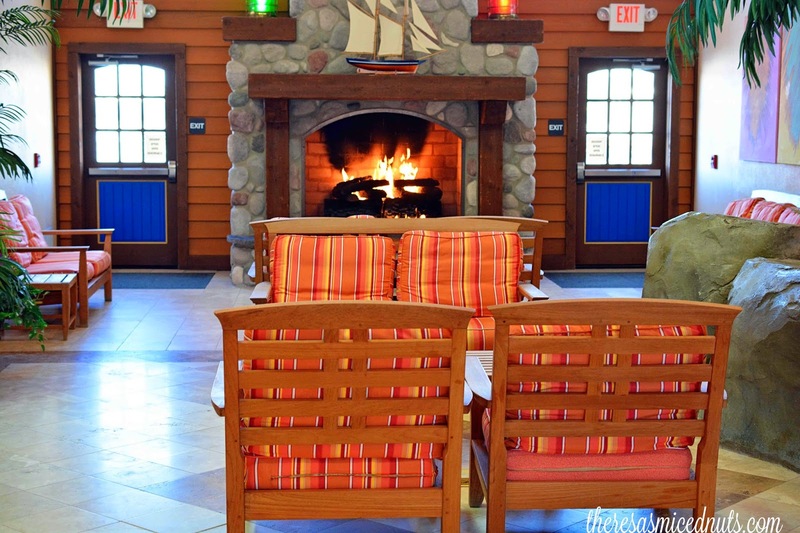 While checking in, the family can have a seat in the cozy lobby area, where you will find comfy seats and a warm fire. As much as I like to sit here and kick up my feet, the girls were anxious to get to the real fun- the indoor water park! 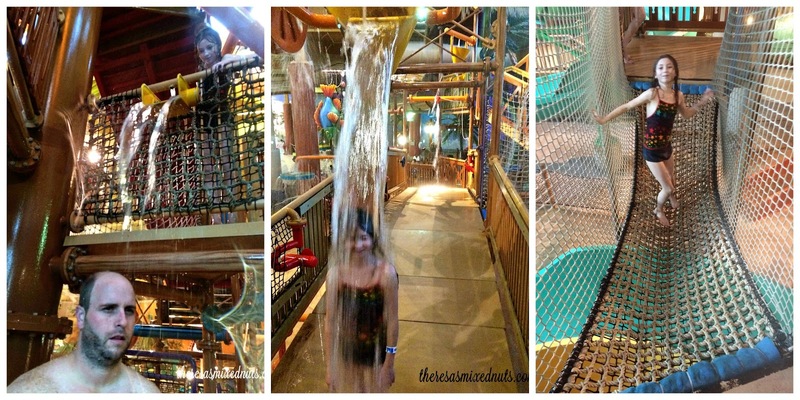 With a wave pool, kiddie area, splash lagoon, and water slides galore, the fun was endless! Complimentary towels and life vests are provided for your use, so you don't have to worry about hauling a bunch of gear down with you. The wave pool is always our first stop. It's a great way to start off a full day of water fun! But watch out! The waves are a little stronger than they look. Allison got swept right off her bottom while her sister looked on laughing. Next we headed over to Cargo Crossings. Allison makes it look so easy to get across, but us bigger folk have a little harder time. Poor Mariah just couldn't stay on the barrels. Located next to Cargo Crossings is Creature Cove. We played a little basketball and hung out on some fun water creatures. Lookout Lagoon offers a lot of opportunities for water play. Rope crossings, water slide access, and Allison dumping a bucket of water on an unsuspecting dad's head made for a grand time! However, the real star of the show, in both my girl's eyes, is the Rendezvous Run! Rendezvous Run is a 35-foot-high, 520-foot water roller coaster that shoots you through a twisting, turning series of slopes before shooting you out the other side of the park. My kids love it so much, I can hear them yelling with delight through the whole ride! 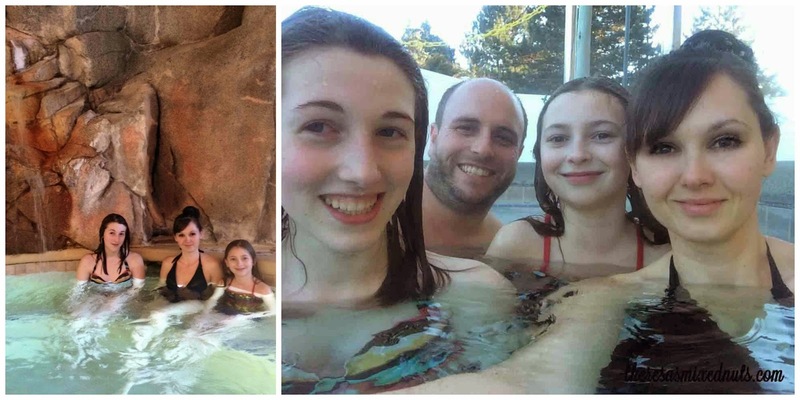 While the girls love the water coaster, the real star in my eyes is The Grotto! Here I could just soak in hot water temps and let the jets massage my aching muscles. The girls loved the novelty of heading to the outdoor section of the hot tub, getting a kick out of being in hot water that's surrounded by snow! Castaway Bay isn't all water fun though. 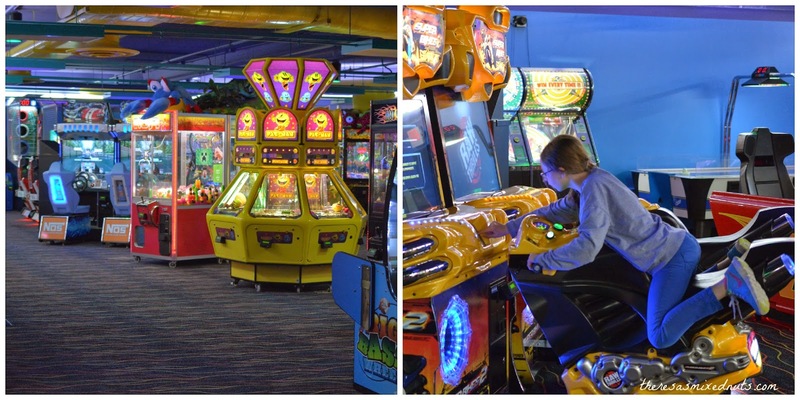 There's a pretty snazzy arcade right next to the water park, where Allison would have stayed all day if we let her! 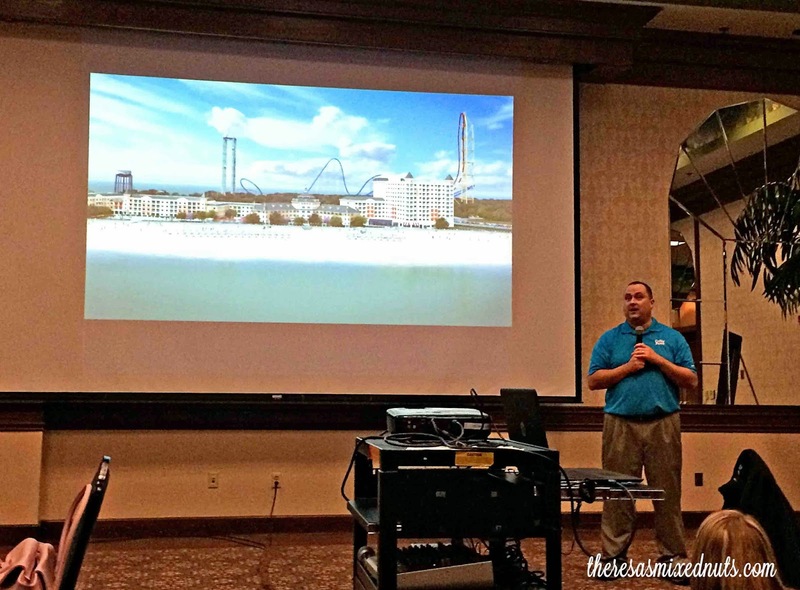 That night, while the rest of the family got to play some more, I got to meet up with some fellow bloggers to learn a little more about Castaway Bay, as well as some other fun attractions in Sandusky, Ohio. (We'll talk about those a little next week.) We were treated to delicious snacks, while Brian Edwards gave a great presentation on Cedar Point's renovated Breakers Hotel, and gave us a look at the new roller coaster Rougarou! In the morning, we headed down to Mango Mikes for some scrumptious breakfast to fuel up for another fun filled day of play. The buffet was loaded with all the breakfast essentials, from yogurt and fruit, to bacon and pancakes. Our server, Riley, was so friendly. She stopped and talked to us about the new Quaker State & Lube restaurant that will be opening in Castaway Bay soon. Jason can't wait for the opening, because when we head to Cedar Point this summer, we are stopping back in for a bite to eat there! Some of the Peanuts Gang come around during breakfast for a little meet and greet. 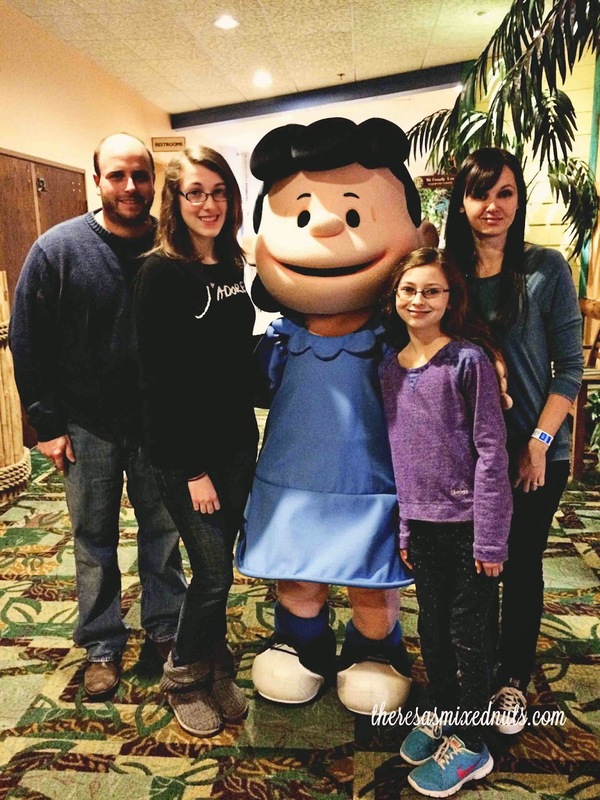 On our way out, we ran into Lucy! By mid-afternoon, we were completely exhausted and decided to pack it up and head home. You know you've had a great time when the kids are so tired they didn't fight once during the 3 hour car trip home. I think we should go back more often! Now that you've seen how fabulous Castaway Bay is, wouldn't you like to plan a little getaway? Castaway Bay is offering you the same package we received at an amazingly low price! 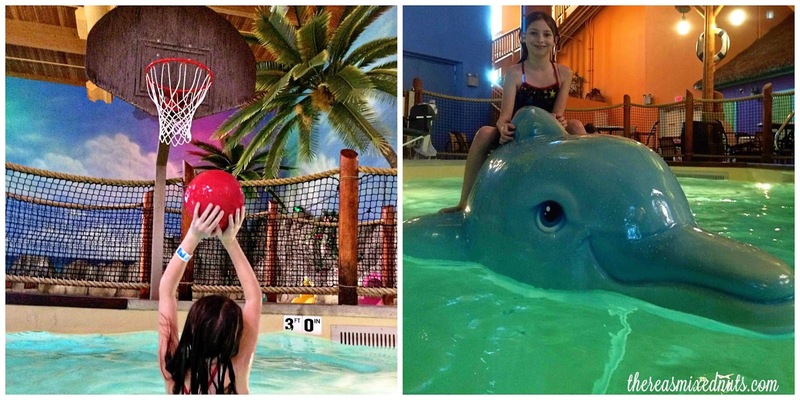 You can enjoy a Room, Water Park and Breakfast Buffet Package, with prices starting at $149! Get this special rate by making reservations on www.castawaybay.com or by calling (419) 627-2106. Use promo code BLOG when making your reservations. Better yet, how would you like to win 4 complimentary day passes to experience it for yourself? You're in luck, because I so happen to have 4 to giveaway to one lucky reader! Giveaway is open to U.S., 18+. NO PO Boxes will be accepted. The giveaway will run through 2/28/15. Winner will have 48 hours to respond to winning email or a new winner will be selected. **All entries are verified. Please make sure you are following all task guidelines you claim entries for. Failure to do so will result in your entries being removed from the form. V. Thompson is the winner. Sorry, V! I accidentally removed your name as a winner when I was going through the final verifications and can't figure how to re-announce it on the widget. Please check your email for details on how to claim your prize! 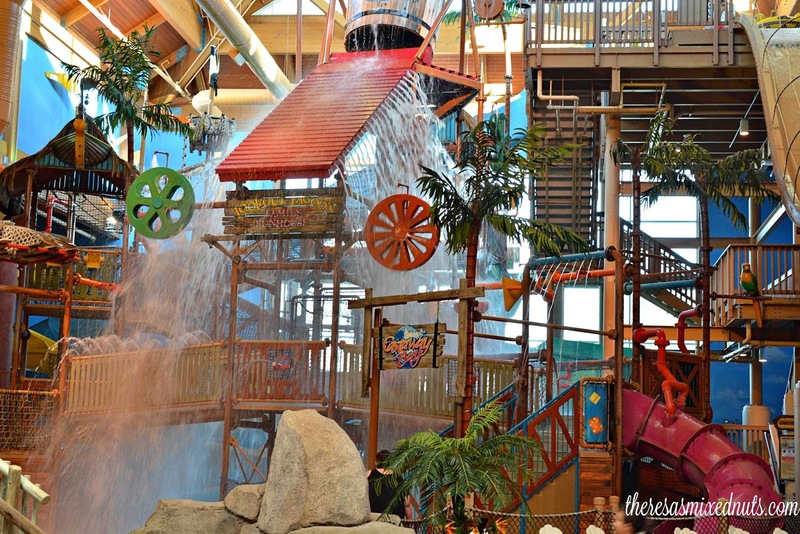 Which part of Castaway Bay would your family head to first? That looks like a blast. My boys would have a field day there! My family would love this!! My boys would love to visit the wave pool or the arcade first. I'm not sure which they would rather do first! I used to live near here before we moved from Ohio to South Carolina. The hotel is clean and located within a 10 minute drive to Cedar Point. The decor is somewhat dated. Worth the money. I really wish I lived closer--but I am in NY and the snow and/or bad weather has been our companion. Oh how I would love to put on a bathing suit and just have fun! sounds and looks like fun times! This looks like a lot of fun. We try to go to a water park every summer. I would love to check this out if I am ever in town. Castaway Bay looks like such a fun time. They seem to have an amazing set up. It's really cool that they have an arcade too! That looks like so much fun! I'd enter, but I'm afraid we wouldn't be able to go. I'd love the splash park area in the water park! I love your photos! I've always wanted to take the kids here! They just love waterparks! This looks like such a fun water park! I know the kids would love it! I'd love to go to a water park with a pirate theme. That would just totally make my day. Fun! That looks like such a blast! I've never been to Castaway Bay, but it looks like the perfect fit for my family. What a fun looking family friendly trip. I'm going to make sure I take my kids here someday. Now that looks fantastic. Loads of fun. Wow this looks awesome! My whole family would absolutely be in heaven there! What a cool place! This looks like an amazing time for the whole family! I bet my daughter would love something like this! Looks and sounds like so much fun. Id love to bring my family here. oh man I wish I could go there, can they come to California!!! Oh my goodness does that look FUN!! I bet my kids would love it. That looks like a whole lot of fun. I think it would be a good time. Wow! This looks like so much fun! You got some great pics, looks so fun-my kids would love it! Whoa! Now this looks like some serious fun! Love all the fun things you can do. I want to visit there with my family! What a fun place! I would totally enter but I rather a real family win (I dont have kids yet) so good luck to the winner! Your pictures look FABULOUS! I would love the Rendevous Run most, I think. My mom lives in Sandusky and she's been sending me newspaper clippings on the new roller coaster. :) Thanks for hosting the giveaway! Wow - those are vibrant, fun colors and a great place to check out for sure! My 4 year old would love this. He's getting more adventurous in the water which I love! So much fun! My kids would LOVE Lookout Lagoon! oh my...what a great place! That Lookout Lagoon might be our first choice..it looks fuuun! We love playing in the water and since winter is here to stay (hopefully not :( ), we haven't got a chance to go to indoor pool like this..it must be awesome! We would visit the Grotto first! This place looks amazing. I know the boys would love it. This looks like an amazing place to take the kids for a vacation. I would love to go here with my kids. What fun to be had! Looks like a great vacation spot! I would most definitely visit the tube slides first then the wave pool. What a fun vacation. Wow this resort looks awesome. My kids would have a ball there! Oh wow! This place looks like so much fun! Just reminding me how much our family needs a vacation! I would love to take my family. Looks like so much fun!! I think it would be hard to chose which to visit first. But I think my girls would love the roller coaster. It looks like so much fun...but we would probably go to the wave pool. We would visit the wave pool first! I would head for the hot tub and the boys would make a b line to the wave pool! Are family would hit up the water coaster first. Now how come you are the only person in the pictures with dry hair? LOL.. that would be me too. Cause we already checked out of our room and I didn't want to drive home with icky, chlorine hair lol. 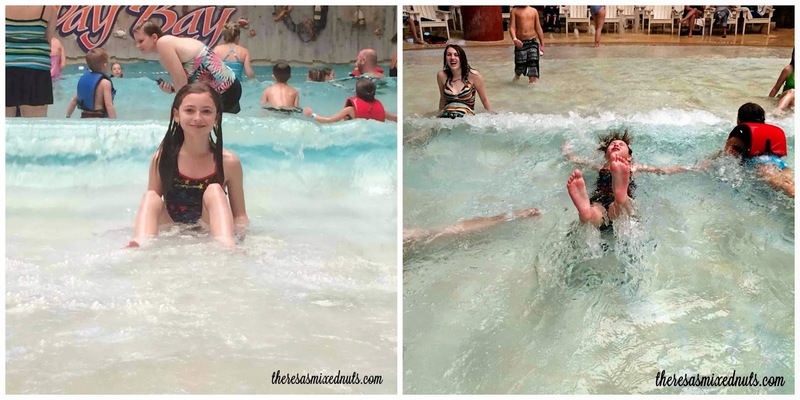 We would do the wave pool first to get used to the water, then hit water slides! Your pictures make me miss it so much! We always head first to the wave pool. I would really love to relax in the new hot tub. The coaster waterslide looks pretty fun too. My youngest would want to go to Creature Cove first. My older 2 would go for the slides. We would hit the wave pool first, then the slides! I'd go to the tube slides first! I would enjoy the wave pool first!